Incredible Edibles - Kauai Seascapes Nursery, Inc. When you hear the word nursery what comes to mind? Maybe babies, or young ones? What happens if I throw in the word plant nursery? Do you envision little buds, blooms, and starts in those cute little pots? Me too! Kauai Seascapes Nursery has exciting new goodies growing for your veggie and herb gardens. Their newest addition is providing locals with organic, and locally sourced starts. 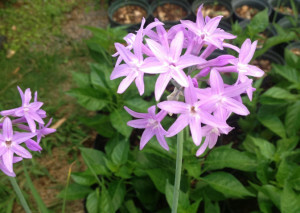 Society Garlic – These dainty purple flowers spice up any dish! These little veggies, herbs, and blooms are lovingly provided by Robin from Heaven on Earth Starts. Robin is known for providing superior quality herbs, greens, and seasonal veggies. Right now there are lots of fun choices including cucumbers, and peppers waiting to be picked up and planted. Plus, coming to the nursery is an inspiring sight. Seeing all the plants blooming and thriving will motivate you to create the yard and garden of your dreams. However, if you don’t have a yard or the time for a garden but love having fresh herbs and veggies at your fingertips, potted and container gardens are easy-to-manage and will live happily on any porch. 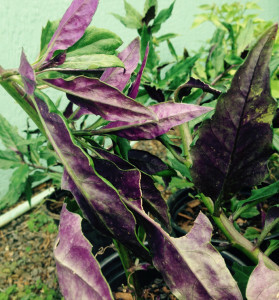 Okinawan Spinach flashes it’s purple leaves. Perfect for salads and stirfry! Nasturtium offer a feast for the eyes and the palate. Society garlic will spread on its own and offer delicate purple flowers that will lively up any salad. If you’re looking for a low-lying bush, Okinawan spinach flashes it’s purple leaves in salads and stir-fries. Sweet Potato grows as a luxurious ground cover and can be ‘sweet’ harvest thats fun for the kids. My personal new favorite at Kauai Seascapes nursery is low-chill Blueberries. The low-chill variety can be grown in warmer climates and will flower and make fruit without the cold. Blueberries are a hardy woody perennial reminiscent of a native species, are not invasive (will not spread all over your yard), and will attract pollinator insects (and birds) to your garden! Living on Kauai with its generous rain, sunshine and fertile soil, provides us with such a great opportunity to grow an abundant garden year round. Kauai Seascapes nursery helps us make this happen. So grab your basket and come on up to the ridge. The Incredible Edibles are waiting! Can the Okinawa spinach shrub grow on the mainland, specially PNW? Or does it require tropical climate? Looks beautiful & tasty too! Hi Rebecca, Okinawan spinach does best in a tropical or sub-tropical climate. It thrives in warm, wet conditions. It is sensitive to frost. If you have a heated greenhouse you may be able to grow it year-round. Hi Timothy, yes we do have blueberries in stock now. Low chill varieties that fruit here in Hawaii. Stop by the nursery to take a look!